This summer has been amazing. I’ve had the chance to do some traveling around our jurisdiction and meet some amazing Shriners and their families. 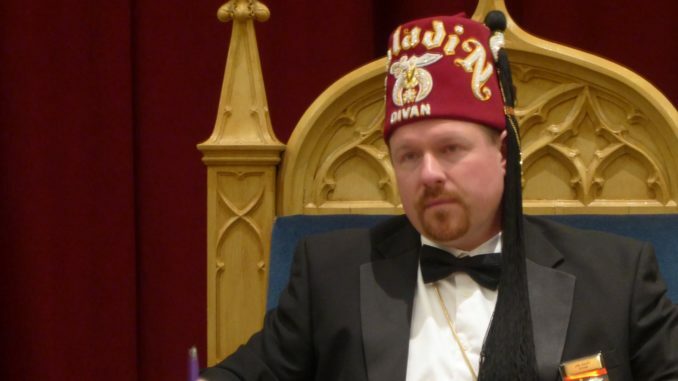 I’ve been able to be in a few parades, attend several club meetings, and share in fellowship with many new Shriner friends. I also had the opportunity to attend my fourth Imperial Session. This year’s session was in Daytona Beach, Florida, and it reminded me of how wonderful our fraternity and philanthropy really are. Now, however, it’s time to focus on the last part of the year. Summer has come to a close as Labor Day has already passed us by. Kids are back in school, and the leaves are in midtransition. Football season is in full swing, and before you know it, we’ll be celebrating Thanksgiving with family and friends. That means that it’s time to look forward to our last few Saladin events for year. The Fall Stated Meeting is just a few days away, our Sinatra themed 2017 Potentate’s Ball, “A Night with Frank,” is coming up quickly on October 14th, and the Annual Elections and the 4th quarter Stated Meeting will be on December 2nd. As you know, your Divan has been working hard on developing a Saladin Strategic Plan in order to guide our decision-making process as we plan for the future. Members of your Divan will be presenting the Saladin Strategic Plan at the September 23rd Stated Meeting. It is very important that you attend that meeting so you can see the work that’s been done to lay the tracks for an improved Shrine experience. We will be talking about our developed mission and vision; values and beliefs; strategies, and timelines. We are very excited to roll this out to you as many hours have been put into developing this plan. Finally, as we look forward to 2018, we are in the beginning phases of planning the 2018 Saladin Officers Installation which will be held on Saturday, January 6th at 2PM at the Grand Rapids Masonic Temple. We will be bringing back the entire experience with a formal introduction, music, ceremony, dinner, and fellowship. 2018 will also bring the Annual Saladin Valentine’s Dinner, a Spring Ceremonial, a Jimmy Buffet themed boat party on Lake Michigan, and many other exciting events. It promises to be a great year, so be sure to not miss out! If there’s anything I, or any of the Saladin Divan officers, can do for you or your family, please let us know. We love hearing from you in positive ways that help move Saladin forward.